Have you ever been in a mood for a brownie and a shortbread cookie? Well, my keto shortbread brownie cookies were birthed out of that exact craving. So if you are looking for a recipe that includes two favorites, you are in for a major treat. Sometimes, when I am creating a recipe I immediately know if it’s going to be winner. By the same token when I know something is not going to work I can tell almost instantly. Thankfully, I knew that these keto shortbread brownies cookies were going to be a hit. It’s moments like these that truly get me excited about keto baking. In case you don’t know I have a complete list of Keto Cookies that any cookie lover doing keto would enjoy exploring. I wanted a keto shortbread cookie, because if I had to pick just one type of cookie, shortbread would definitely be my choice. My goal was to create a low carb option that resembled a cookie that I used to make all the time for my friends and family before I went keto. Those cookies were a combination of both a brownie and a shortbread cookie and they were a rich decadent treat. So the challenge of creating a keto, low carb brownie shortbread cookie was on. Because I needed this type of cookie back in my life and I was determined to make it happen. Who wouldn’t want the best of a classic brownie with a rich layer shortbread? Exactly! Well, I am happy to share that this challenge was conquered and keto brownie shortbread cookies were birthed. Honestly, they are simply amazing! And just like that I created a new favorite low carb, keto cookie recipe for your all to enjoy. Low carb brownie shortbread cookies have a bottom layer of rich buttery shortbread cookies, and the richest brownie you will ever have. The added brownie top layer is a game-changer in my book. Why? Because you know what’s better than a keto carb shortbread cookie? One that has a keto brownie layer. It’s perfect for those times when you can’t decide what you’re in the mood for. Frankly, I don’t know why it took me so long to sit down and create these low carb brownie shortbread cookies. All I can say, is you’ll be glad I finally did. If you decide to make any of our recipes, please take a quick picture and make sure to tag us on Instagram, or Facebook. You have no idea who much it encourages me to keep creating for you when I see your pictures. 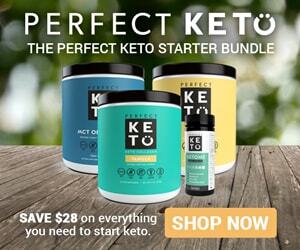 Use this link and get a 15% off discount when you place your order for any of Perfect Keto’s products.The discount will be added automatically at checkout. Wondering which foods you should avoid when doing Keto? This Keto Food Guidewill assist you in doing the Keto Diet correctly. 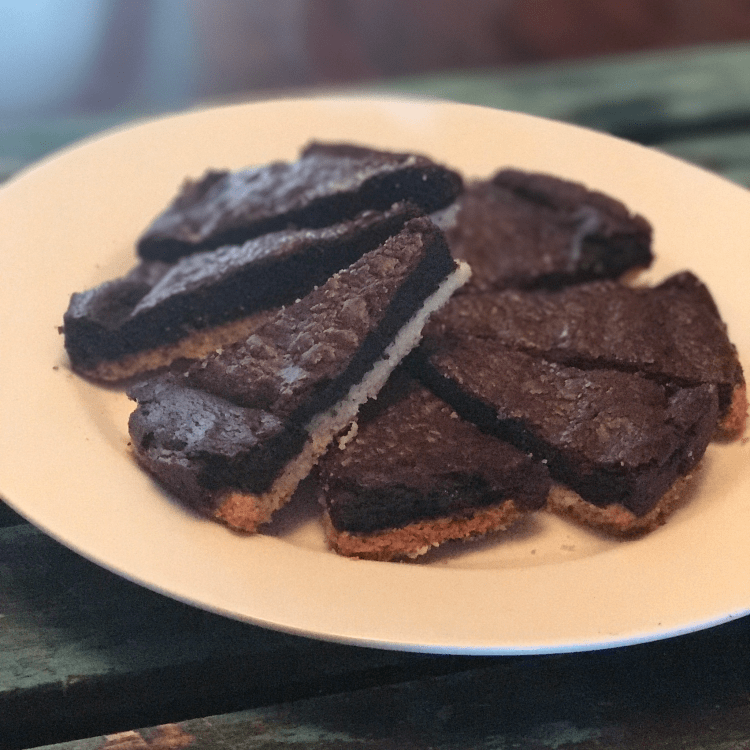 A delicious keto brownie with a shortbread base. It gives you the best of a brownie and a shortbread cookie. Lightly grease an 11X7 pan or a 10-inch round spring form pan like I did. Create the base of this cookie by mixing the almond flour and sugar substitute in a stand-up mixer. Once combined add the softened butter until dough forms. Place the layer of this dough into the bottom of your pan. I use wet hands to pat the dough so it doesn’t stick. Melt the chocolate and butter in a double-broiler or use the microwave in 1 minute intervals. Make sure to mix well and then set aside to cool. To the melted and cooled butter and chocolate mix, add the 2 eggs,sugar substitute, baking powder and sea salt. Whisk well until fully combined. Bake for about 20 minutes until the top rises slightly. The center will drop once it cools. You don’t want to over bake them so that they maintain a rich fudgy texture on top. Allow them to cool completely before slicing and enjoying. Do you use the powdered Swerve or the granulated? Does it matter? Thanks for the recipe! Hi Laurie, I use the granulated but I suspect that either would work well. Enjoy ?